Botox injections are a diluted form of botulism which is injected into facial muscles to paralyze or weaken the muscles that form wrinkles. In 2010 the procedure was performed in the United States more than 5 million times. Botulinum toxins were first researched in the late 1960s to treat neurological disorders. Botox was first approved by the FDA in 1989 to treat eye muscle disorders (blepharospasm, uncontrollable blinking, and strabismus, crossed eyes). 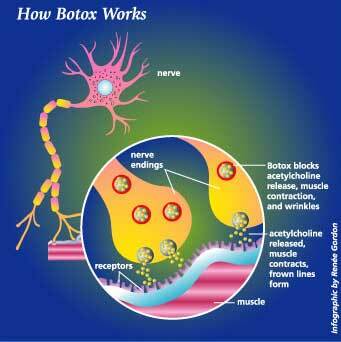 In 2000, Botox was approved to treat cervical dystonia (a disorder that causes severe neck and shoulder contractions). As an unusual side effect of the eye disorder treatment, doctors observed that Botox® softened the frown lines between the eyebrow. See FDA Article for more information. FDA Approval In April 2002, the FDA was satisfied by its review of studies indicating that Botox® reduced the severity of frown lines for up to 120 days and approved the drug. It is under review for approval to treat brow furrow, migraine headache, chronic tension headache, upper limb spasticity, juvenile cerebral palsy, and hyperhidrosis. What kind of wrinkles do Botox® injections treat? Wrinkles that are caused by muscle contraction, such as frown lines, crow's feet, forehead creases, and neck bands can be safely and successfully treated with Botox®. According to The American Society for Aesthetic Plastic Surgery the average physician cost nationwide in 2015 for Botox was $400. What to expect at your initial visit. You will be asked to contract the facial muscles (frowning, squinting) that affect the area to be treated. This will help your surgeon determine the best location for the botox injection. The botox injection is normally injected directly into the muscle with a tiny needle. • Ask questions and be informed about the benefits and risks involved with botox injections. •Choose a medical setting using sterile techniques. Necessary equipment should be available to respond to any potential problems. •Avoid alcohol and remain upright for several hours following the botox procedure. Results of Botox Injections. Results of botox injections are normally seen within a few days. The results generally last 3-4 months and require occasional touchups. Recovery after Botox®. There is generally no recovery period after a botox® injection. You can go directly back to your normal activities. Safety and Side Effects. Botox® is proven to be safe and effective. Over the past 20 years, Botulinum Toxin Type A has been evaluated in more than 200 studies. There are no documented systemic complications associated with Botox® injections. © 2016 SmartFaceLifts.com. All rights reserved.